With the continuing proliferation of mobile devices, distracted driving is quickly becoming the most common form of reckless and inattentive driving that we encounter on a daily basis. Many people do not realize just how distracted they are when they choose to look down at the phone while driving on a street or highway. Did you know that taking your eyes off the road while driving 55 miles per hour, for even one sec means that you will have missed traveling the length of a football field? A typical text messages takes up to five seconds to send. If a child runs out into the road or a car in front of you suddenly brakes that means you are probably going to be involved in a car accident at high speed, with no time to react or avoid the collision. That should be a scary thought for anyone. It is important for all drivers to keep a cell phone out of their hands while operating a motor vehicle. The latest statistics show motor vehicle fatalities are up 6% from 2015. More than 40,000 people were killed in car accidents last year. There is no doubt that distracted driving contributed heavily to many of the fatalities experienced across our nation. 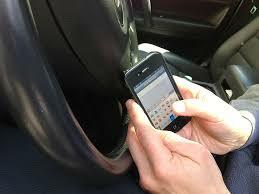 A main reason for using a cell phone while driving is to check social media accounts. People are actually checking their Facebook and Twitter accounts while driving a car down the highway and even making posts to the accounts at the same time. The dangers of this kind of behavior are immense and they go without stating. We are all part of the social media trend in some way or another. However, this does not mean that you should use social media while driving. You are endangering both yourself and everyone else on the road by dividing your attention between the road and your phone. If you or a family member have been injured in an accident that was caused by a distracted driver, contact us at the Law Offices of Jeffrey S. Glassman to discuss your case. We offer free consultations for all accident victims. If we take your case, we do not collect a fee unless you recover for your injuries. We will fight to get the compensation you deserve. We can be reached at 617-367-2900 and are standing by waiting for your call.